At least one Palestinian has been killed in a fresh Israeli air strike on the Rafah refugee camp in the southern Gaza Strip, Palestinian witnesses say. The attack came just hours after two Palestinians were killed in another Israeli air strike on the camp. Israeli military sources said earlier that missiles were fired at militants it said were trying to plant a bomb on a road used by Israeli vehicles. On Tuesday, two Palestinians died in a separate Israeli strike in Gaza City. Israel stepped up its attacks following suicide bombings in the port of Ashdod on Sunday which killed 10 Israelis. Sunday's attack was carried out by two teenagers from Gaza. It was the first deadly attack on a strategic installation in at least three years of Israeli-Palestinian conflict. That prompted Israel's security cabinet to resolve to increase operations against militant groups and their leaders. Officials said the decision was not aimed at permanently reoccupying parts of Gaza. Palestinian ministers condemned the decision. In the latest attack, Israeli helicopter gunship targeted a group of fighters that had gathered near the site of an Israeli ground operation in Rafah, Palestinian witnesses said. They said that civilians were also among the crowd. Earlier on Wednesday, Israeli tanks, jeeps and bulldozers moved into the Rafah. During the operation, troops identified a group of men trying to plant a bomb, military sources said. Missiles were fired from an Israeli helicopter, slamming into a house and killing two men - a militant and a bystander. Medics said at least eight people had been injured in the attack. Military sources said the army was in the camp trying to uncover tunnels used by the Palestinians to smuggle arms from Egypt into the Gaza Strip. Earlier on Tuesday, Israeli forces launched an air attack on another camp outside Gaza City, killing two Palestinians and wounding 12. Israeli officials said two weapons factories were destroyed. 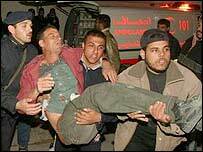 An Israeli military spokesman confirmed that members of the radical Islamic Jihad group were the target. Islamic Jihad said one of the dead belonged to its military wing, but that another militant had survived the attack. Palestinian sources said the dead included a passer-by. Palestinian Cabinet Minister Saeb Erekat denounced the air strike. "What's needed to break the vicious cycle of violence is not the mentality of revenge but the mentality of reconciliation and negotiations," he said. After Sunday's bombing, the Israeli Prime Minister, Ariel Sharon, cancelled a meeting with Palestinian Prime Minister Ahmed Qurei, which had been tentatively set for this week. "One of those killed was a militant belonging to a group called The Popular Resistance Committee"